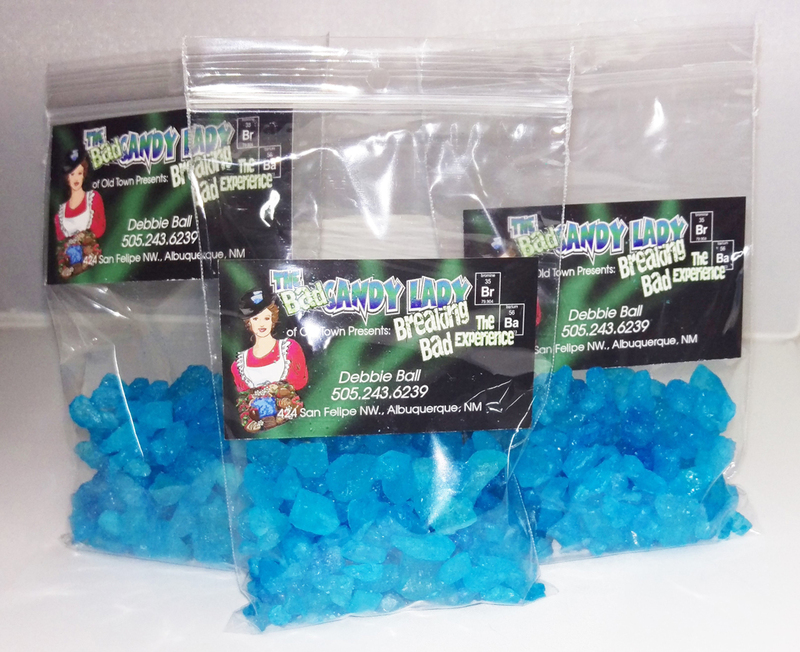 Breaking Bad Candy is the instantly recognizable blue ice candy that revolutionized the Albuquerque Market: This is an exclusive Candy Lady product, modeled after the show prop that we were asked to produce for Breaking Bad (seasons one and two). This is an item ready for distribution with your friends Heisenburg “Clarity” Blue (CandyLady)This Product is packaged in 100 gram bags with the Candy Lady business cards to avoid any confusion with law enforcement. Albuquerque’s infamous The Candy Lady AKA The “Bad” Candy Lady was originally approached by the Breaking Bad’s Prop Department to produce an edible show prop for first Season. They wanted something that did not look like regular street Meth. Debbie Ball came up with a crushed “white” crystal rock candy flavored as cotton candy for them. Breaking Bad then continued to purchases the prop for filming the second season. Retail sale, in the Blue Breaking Bad Candy, began after it was featured on the The David Letterman show. Breaking Bad cast member Bryan Cranston (Walter White) presented it as a gift to Letterman. Here is an honorable mention video on Youtube. The Candy lady does not endorse recreational and illegal drug use. Here we encourage people to use the show’s popularity and events to teach others about the Real Consequences, Life Cost and Danger of “Meth” and other illicit drug use.